Don Johnston Inc. | Introducing Roberta’s Corner! You are here: Home » Blog » Blog » Blog Posts & Articles » Newsletters » Introducing Roberta’s Corner! 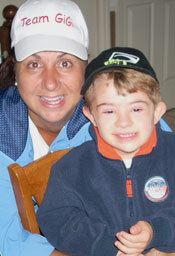 Welcome to the first issue of a new newsletter for parents of children with disabilities. My name is Roberta Costion, I am a wife, a mother and the newest addition to Don Johnston. I’m writing to you because I feel I can help you as a parent ensure your child gets access to the supports he/she needs to succeed in school. You see, my son Jack, has Down syndrome. Even though Jack is in a district that has a solid special education and assistive technology program, I feel like I have to constantly advocate for him. I can’t tell you how many times I have left an IEP meeting feeling like Momzilla. Still, in my quiet moments I sometimes think, am I doing enough? As parents, we all want to help our children succeed in every way possible. And as we are well aware, each child learns differently—that means each child with Down syndrome, each child with autism, each child with a physical or learning disability. Here’s the thing—I have high hopes for Jack. I believe that all children can attain some level of literacy success. That’s what brings me to Don Johnston—we have a common mission. And as a matter of fact, I first learned of Don Johnston products through Jack’s school. Jack used Simon S.I.O, one of the Don Johnston phonics programs, to learn his alphabet and early word patterns—at five years old! Jack is now seven and doing well. Over the next few months, I’d like to share with you some of the barriers and issues I’ve encountered along the way (and any new ones that might arise!) We’ll discuss laws, school initiatives, and literacy products that can help your children with their reading and writing. I’ll also touch on community and advocacy programs that can help you have impact. Hopefully, I can be a resource to you and provide you with some insights based on what has worked for me and what hasn’t. Oftentimes I longed to feel as though someone was in my corner, and sometimes there was someone. My personal experiences, and the resources at my fingertips here at Don Johnston, equip me to be in someone else’s corner—your corner! I hope you’ll join me.